Antique - Clyde Pottery, "British Rivers" Pattern, Blue and Cream, Ironstone Meat Platter, made from 1814 to 1841, Great condition. 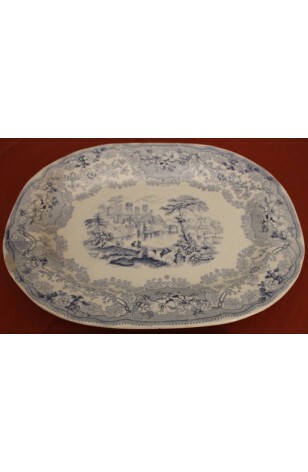 This beautiful Clyde Pottery Blue and Cream Ironstone Meat Platter, being in the "British Rivers" Pattern.. Showing a view from the River Bank, looking across over to the Bridge in the distance. A Cattle Herder (drover) and his cattle are on the River Bank, while in the distance, are "ruins" of Castles and Churches. This Platter is from the very early 1800's, even though, as seen in the picture, a slight abrasion on the Lip, in very good condition, when we consider its age.